Home Articles News ANSM Single-dose products: beware of confusion! They are practical and hygienic, and pods can contain very different products like cosmetics, drugs, biocides… But when we use one instead of the other, it can be dangerous, especially young children. ANSM has just launched an awareness campaign on the subject. It is because the ANSM regularly receives reports of medication errors and the risk of medication errors related to confusion between single doses that it launches this awareness campaign. Of the error reports, more than half resulted in adverse events, 1/5 of which were considered serious. 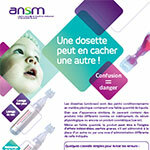 The ANSM is therefore launching an information campaign, with the distribution of a poster offering various tips to limit the risk of confusion between single doses, and is aimed primarily at the general public, especially parents of young children. Most of the errors reported occurred at home and were carried out by parents or relatives, mainly affecting infants and children. The ANSM also points out that health professionals have a decisive advisory role: in particular, they must ensure that the patient's parents or relatives understand how single doses are administered, and immediately report any adverse reaction of which they are aware to the regional pharmacovigilance centre on which they depend geographically. - Read the single-dose label statements carefully and check the route of administration. - Do not identify the product solely by its presentation as a single dose. - Store single doses in their original container (out of the reach and sight of children). - Do not store single doses for nose or eye washing, such as saline, and single doses for skin disinfection, such as chlorhexidine, in the same place. - Remove the single dose after use, even if it still contains product, since it is single use.